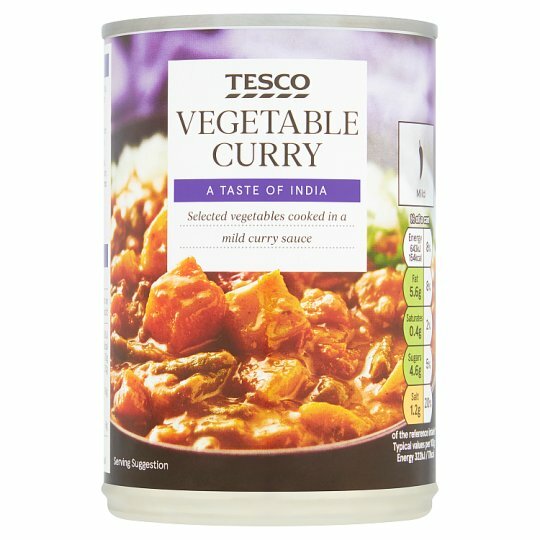 INGREDIENTS: Vegetables (42%), Water, Chopped Tomatoes In Juice, Wheat Flour [Wheat Flour, Calcium Carbonate, Iron, Niacin, Thiamin], Rapeseed Oil, Red Split Lentils, Tomato Purée, Sugar, Cornflour, Salt, Coriander, Coriander Leaf, Paprika, Cumin, Concentrated Lemon Juice, Milk Proteins, Fennel Seed, Turmeric Powder, Cardamom, Garlic Powder, Chilli Powder, Ginger, Fenugreek, Black Pepper, Cassia, Colour (Carotenes), Tamarind, Clove, Nutmeg, Mustard Powder, Cinnamon, Caraway, Oregano, Vegetables in Varying Proportions: Carrot, Potato, Onion, Green Bean, Garden Peas. Store in a cool, dry place., Once opened, transfer unused contents into non-metallic container, cover and refrigerate. Consume within 2 days. Instructions: For best results microwave. MICROWAVE 800W 3 mins/900W 2½ mins. Empty contents into a non-metallic bowl and cover. Heat on full power for 2 mins (800W), 1½ mins (900W). Stir, then heat on full power for 1 min (800W/900W). Stir well before serving. Instructions: HOB 3-4 mins. Empty contents into a saucepan. Heat gently for 3-4 minutes, stirring occasionally. Do not allow to boil.